On Thursday morning, I contacted the MCofS to request the combination lock code to gain vehicular access to Glen Strathfarrar. 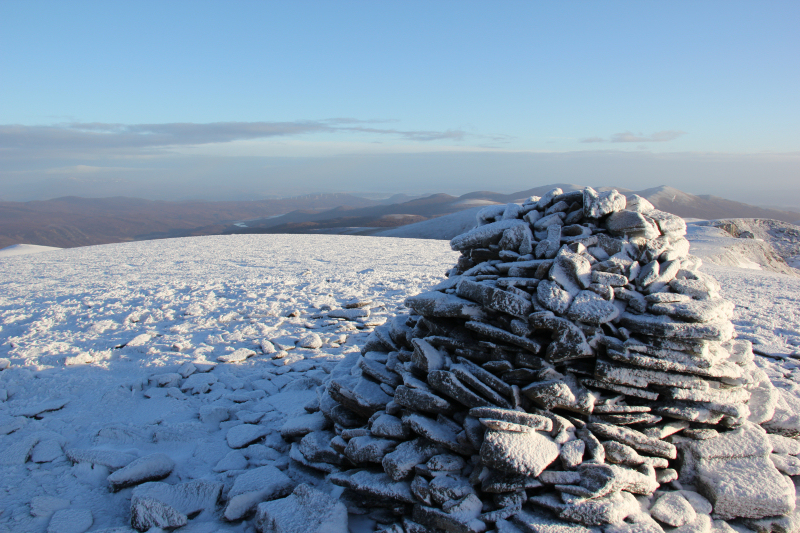 During the winter months, there is no gatekeeper and no associated time restrictions, albeit you are still not permitted to leave a vehicle in the glen overnight. 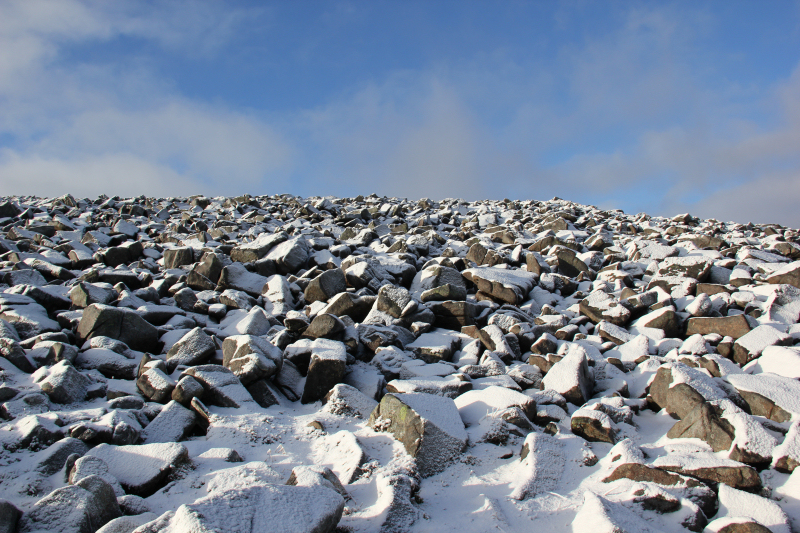 Winter vehicular access is only available to MCofS members – more info. 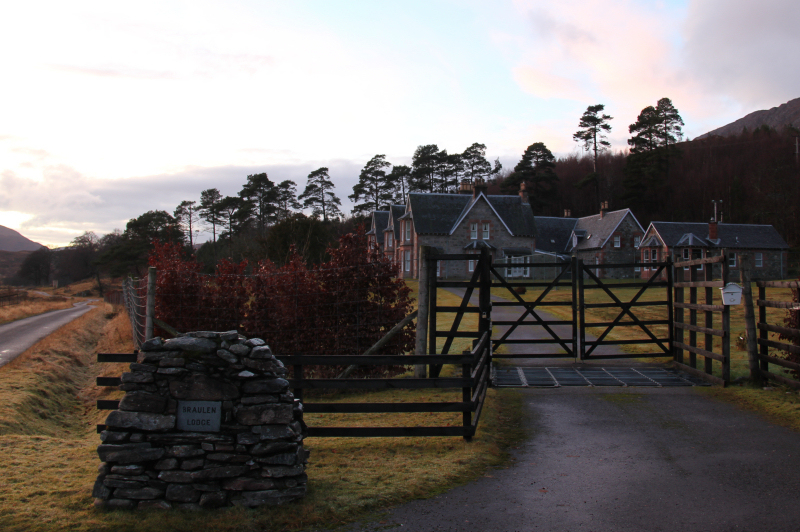 On Friday morning, I arrived at the gate around 08:00 and let myself through. 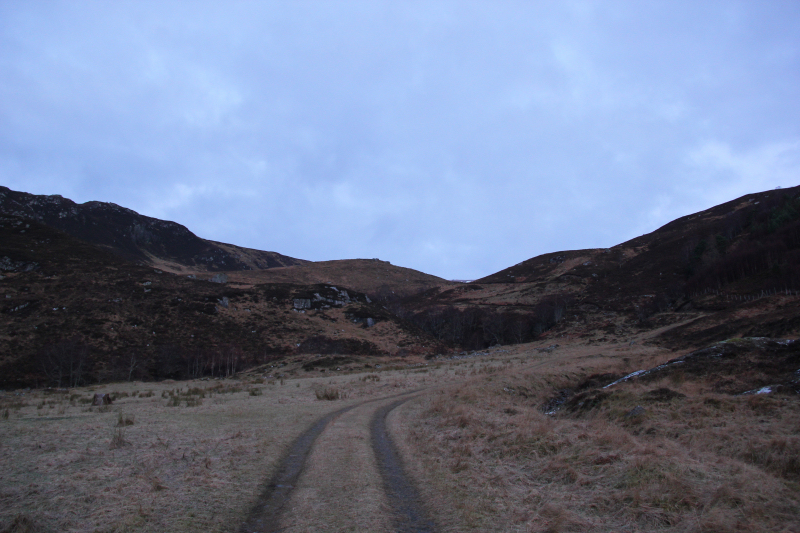 It had originally been my intention to drive as far as the Monar Dam and either pick-off some of the easy Sub2000ft Marilyns or to head for the remote An Cruachan. 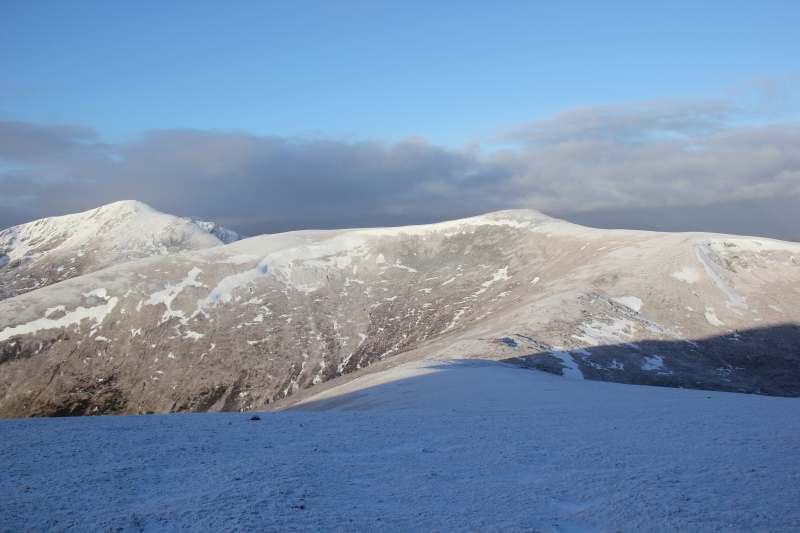 Instead I decided to re-ascend the four Strathfarrar Munros including the two Munro Tops. Once beyond the gate, I drove along the glen to just beyond the power station. 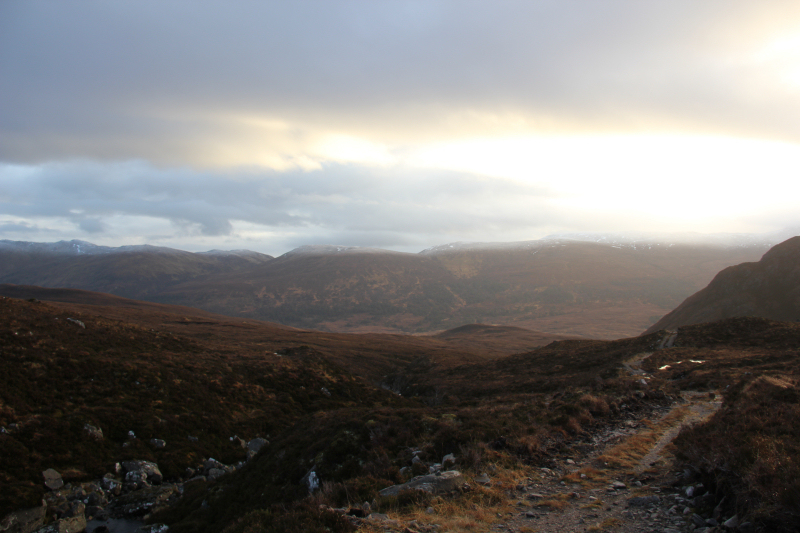 I parked at the start of the track leading towards Sgurr na Ruaidhe. 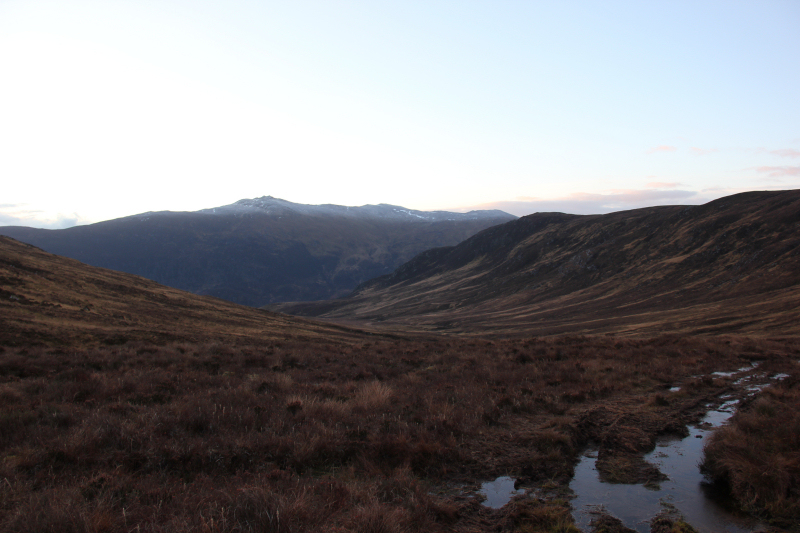 There were literally hundreds of stags in the glen. 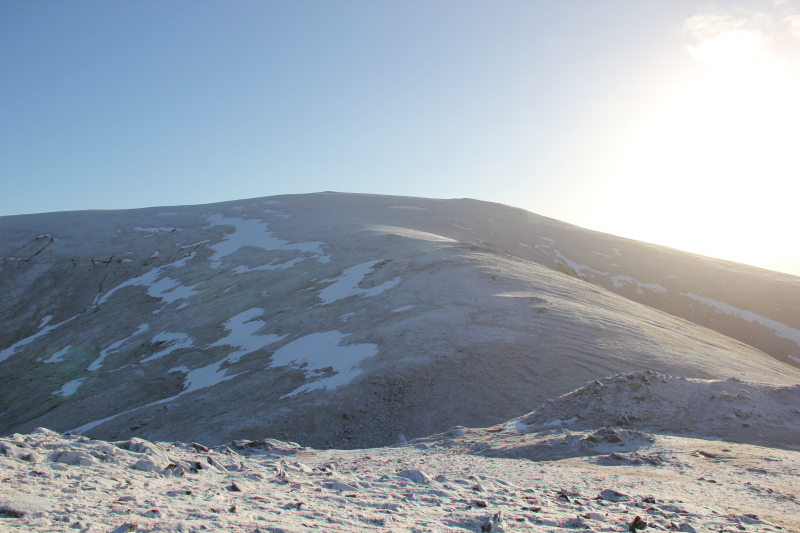 I first ascended the Strathfarrar Munros in April 2003, with Sheryl. At the start of the walk, I met another walker who had cycled down from Inverness. 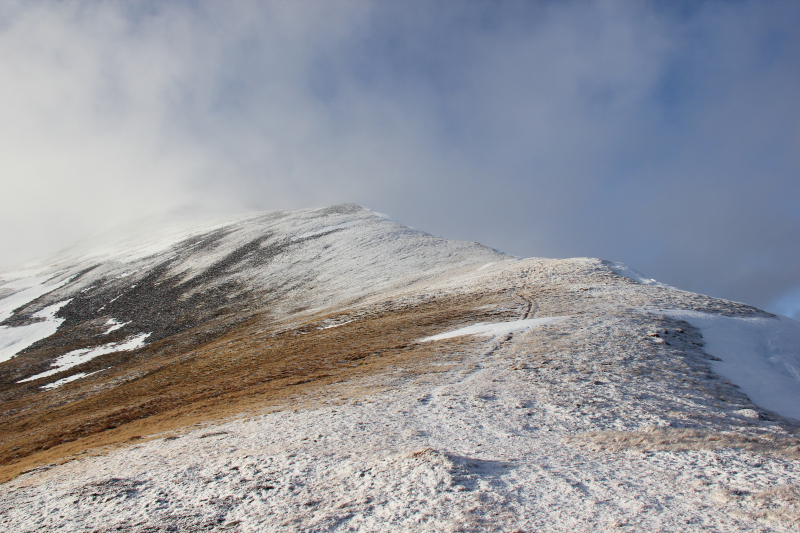 On asking if he was also intending doing the circuit of four Munros, he advised that he was only intending going as far as the first or second Munro and then returning. 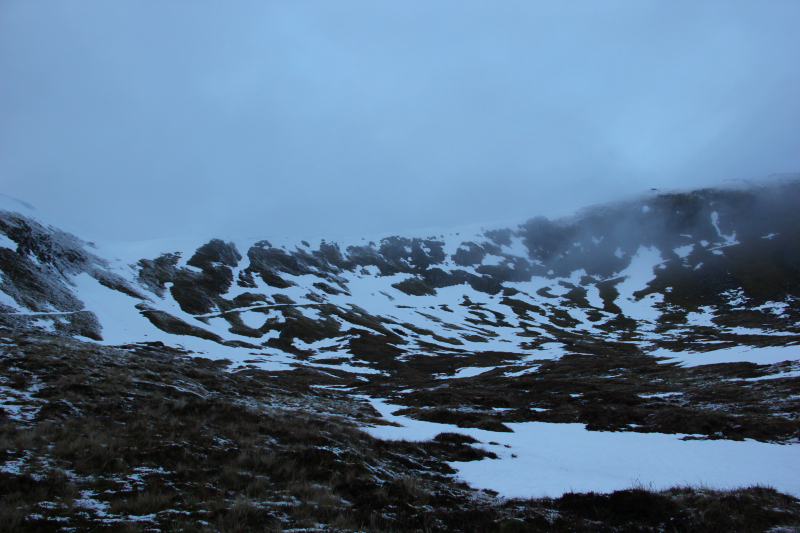 I set off up the fairly good track leading to Coire Mhuillidh. 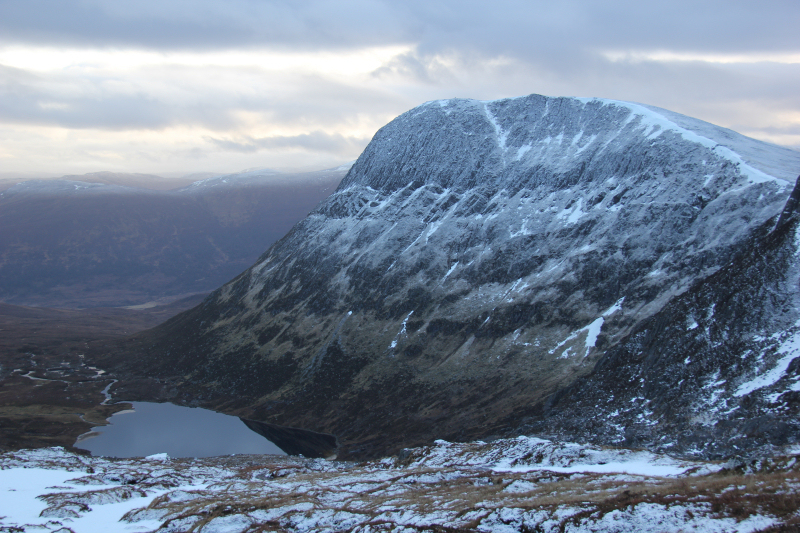 Once in Coire Mhuillidh it was a bit of a bogfest. 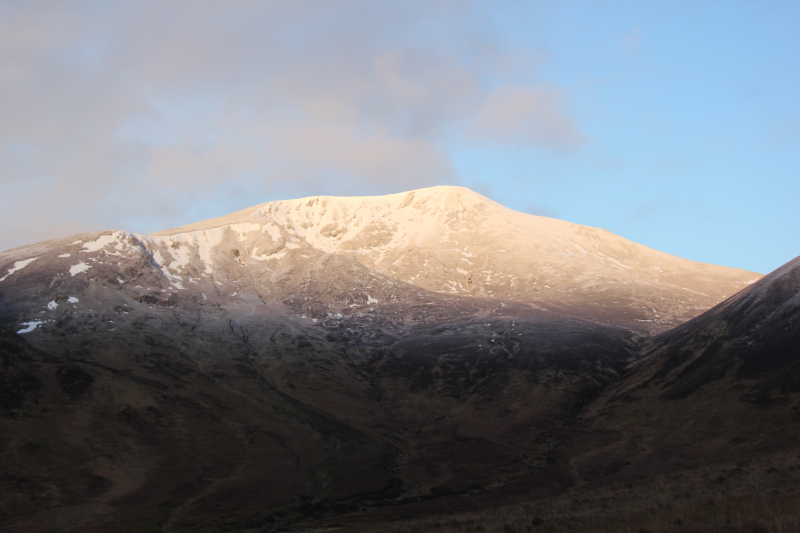 On catching my first glimpse of Sgurr a’Choire Ghlais, I was a little surprised to see so much snow. 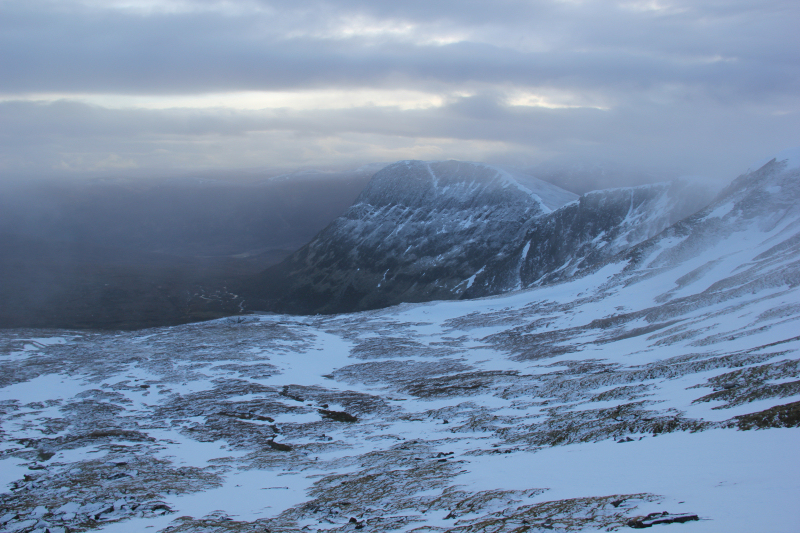 I had seen some photos on Facebook of Beinn Alligin the day previous, which was devoid of snow. 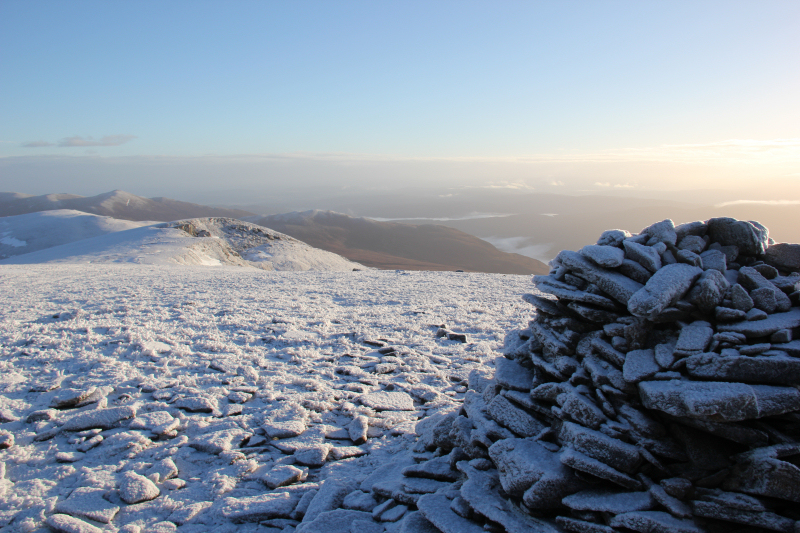 Looking back, I could see that there wasn’t much snow on Sgorr na Diollaid (Corbett). 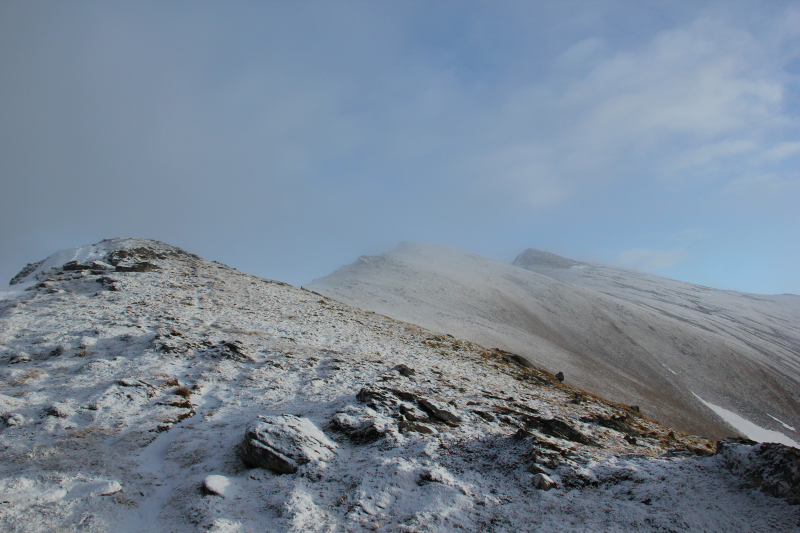 The snowline was sitting around 800m. The next photo shows that the track was fairly wet underfoot. Much of the wetness was easily avoided to the side of the track. I was glad to be wearing fairly new boots, as my feet remained dry. I always enjoy seeing nice warm colours as the sunshine starts to light up the hills. 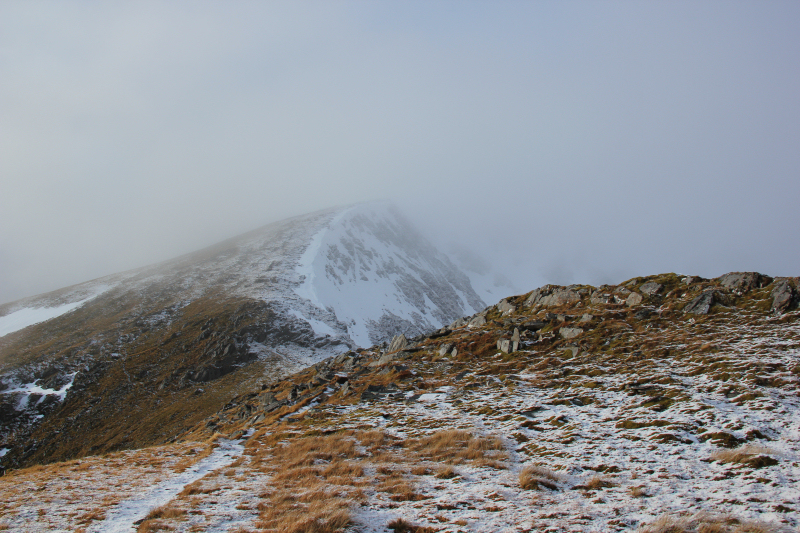 As I ascended the North-West flank of Sgurr na Ruaidhe, I could see the walker I met at the start about ten minutes ahead. He set off about ten minutes before me so we were pretty-much going at the same pace. 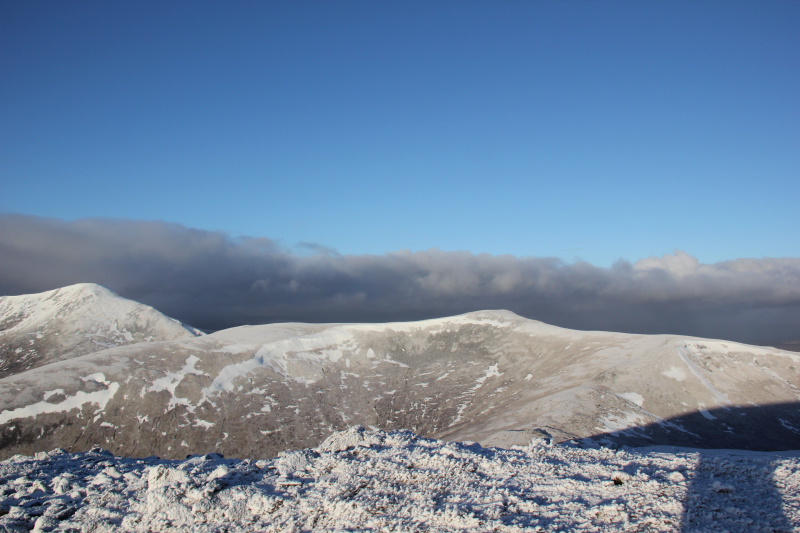 The MWIS forecast had suggested 40% cloud-free Munros. 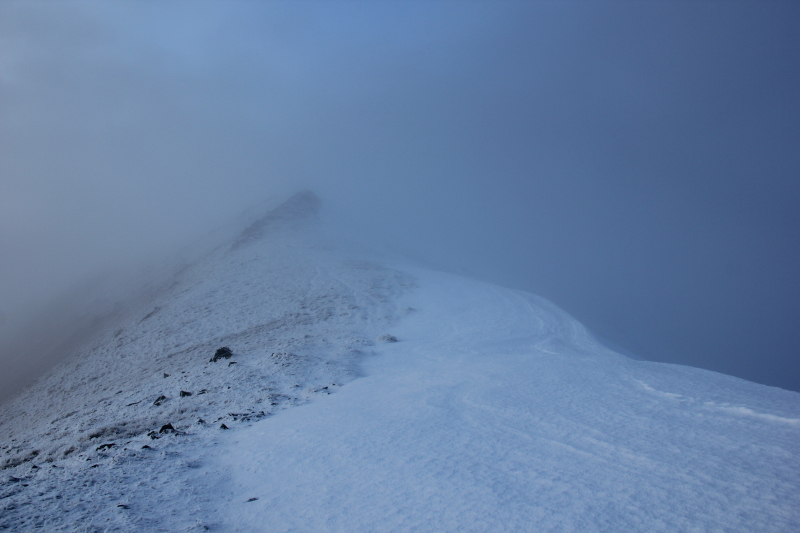 I was therefore quite happy to be walking in mostly cloud-free conditions. 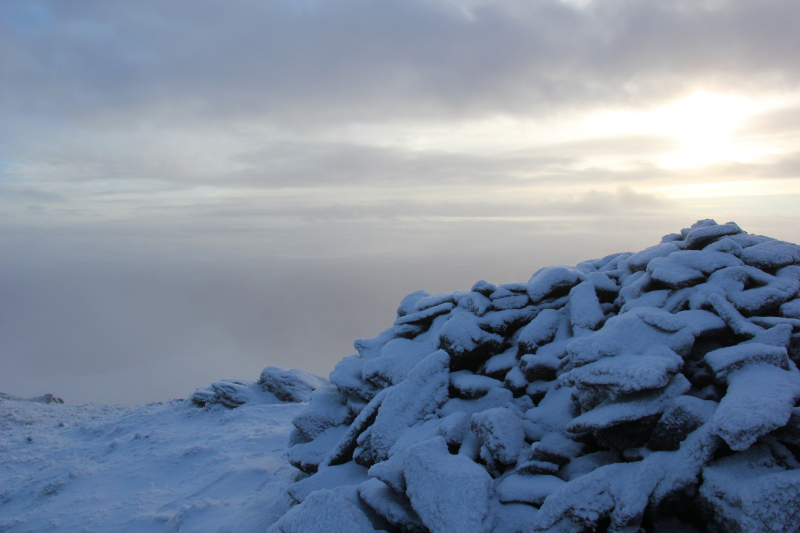 As I approached the summit of Sgurr na Ruaidhe there was still only a very light covering of snow. 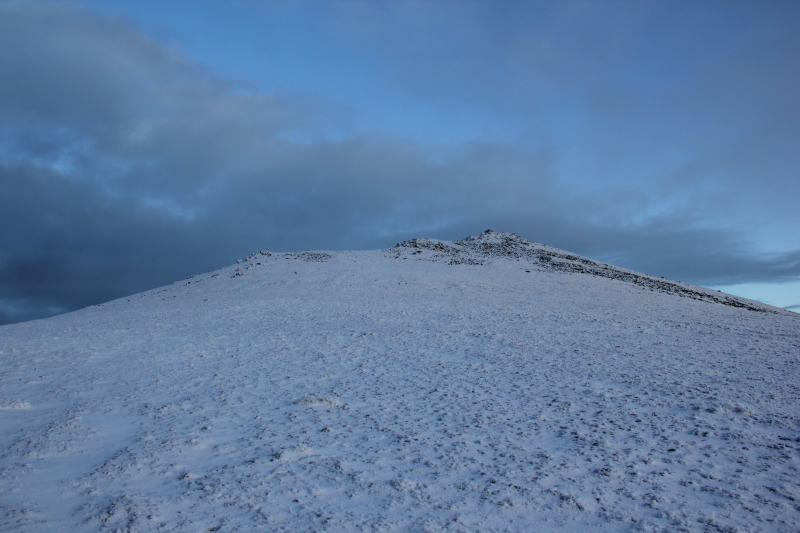 On arriving at the summit, I had another brief chat with the other walker who had decided to head back the same way from Sgurr na Ruaidhe. Always disappointing to have to look down onto a windfarm from the summit. 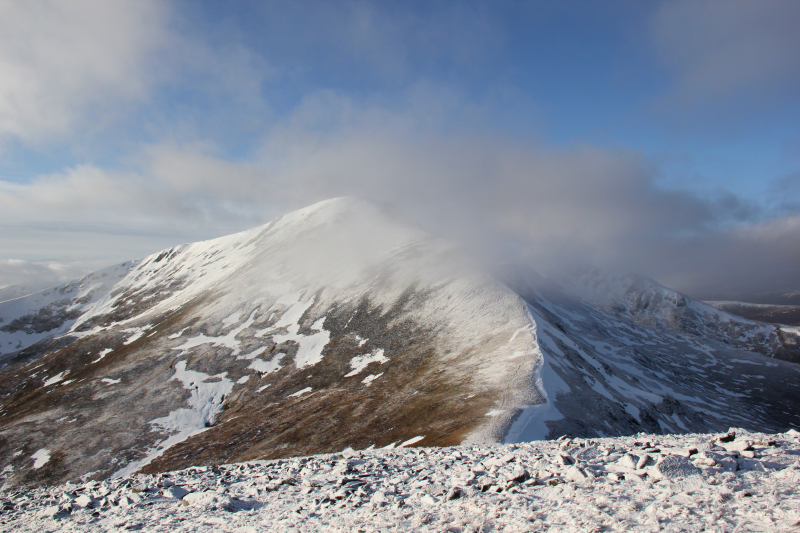 Carn nan Gobhar, the next Munro, looked straight-forward. 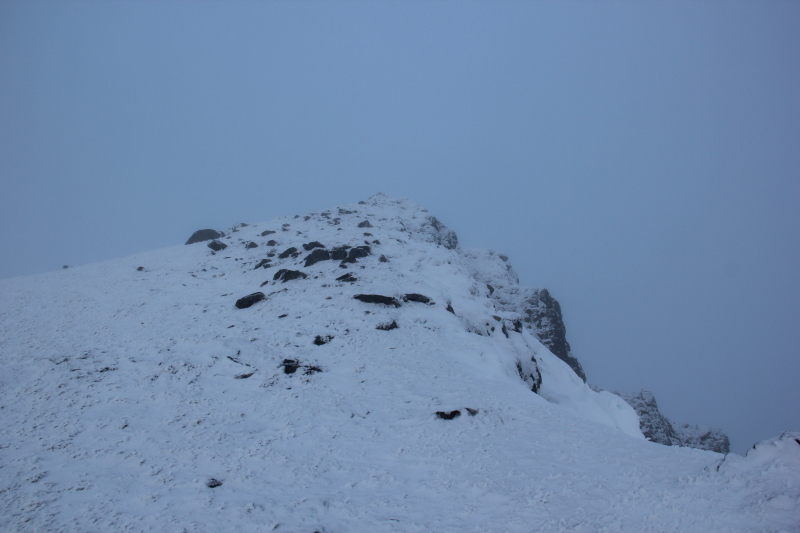 However, from a distance Sgurr a’Choire Ghlais looked a bit trickier given I was wearing my three-season boots and had no crampons. It didn’t take long to reach the col as the short grass made for easy walking. As I made my way up Carn nan Gobhar, I could see that the underfoot conditions were about to change from short grass to boulderfield. Crossing the snow-covered boulderfield definitely slowed me down. I was only carrying 1 litre of water for the day, so my Ribena was strictly rationed to a cup of hot Ribena at each summit. 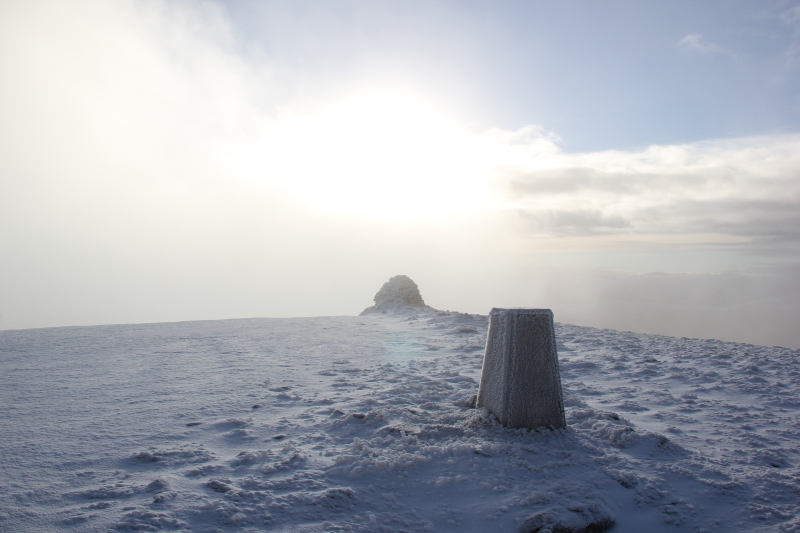 Always nice to have a hot drink at the summit(s) on a cold winter’s day. 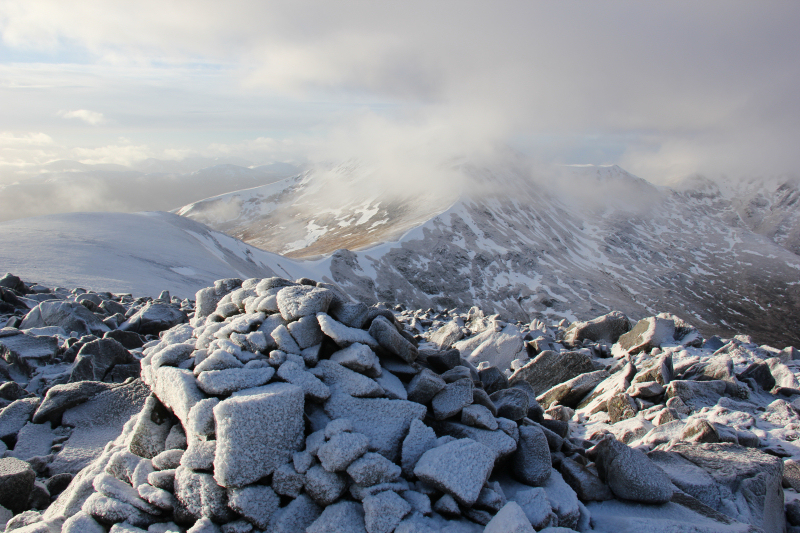 From the summit of Carn nan Gobhar, I followed the wide ridge towards Sgurr a’Choire Ghlais. As is normally the case, the ascent looked much easier from up close. 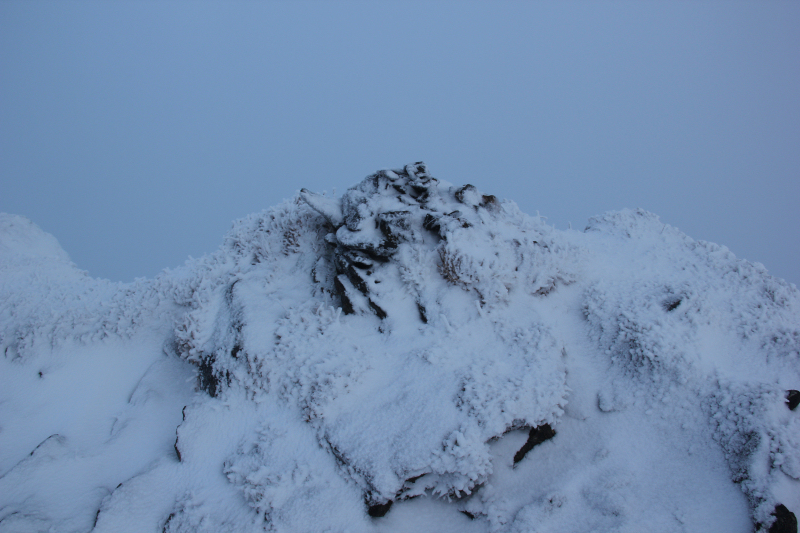 About half-way up the steep slopes of Sgurr a’Choire Ghlais, I swapped walking poles for ice axe. 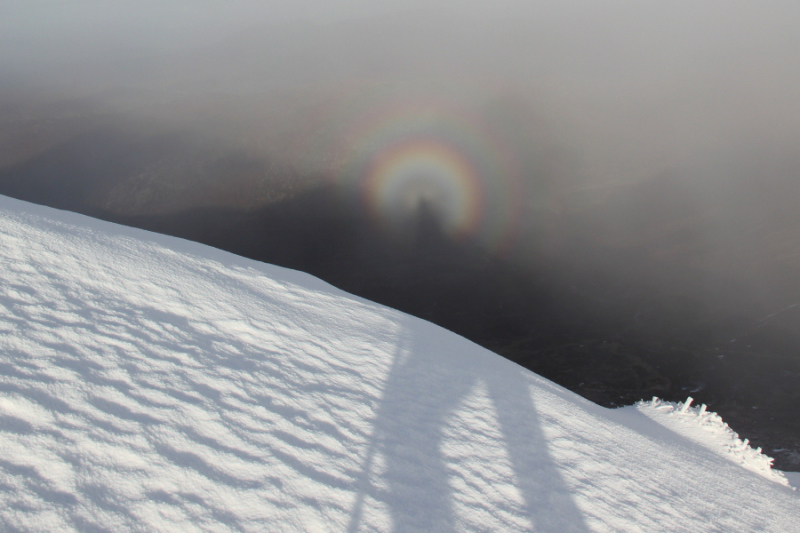 I was treated to numerous Brocken Spectre during the ascent . 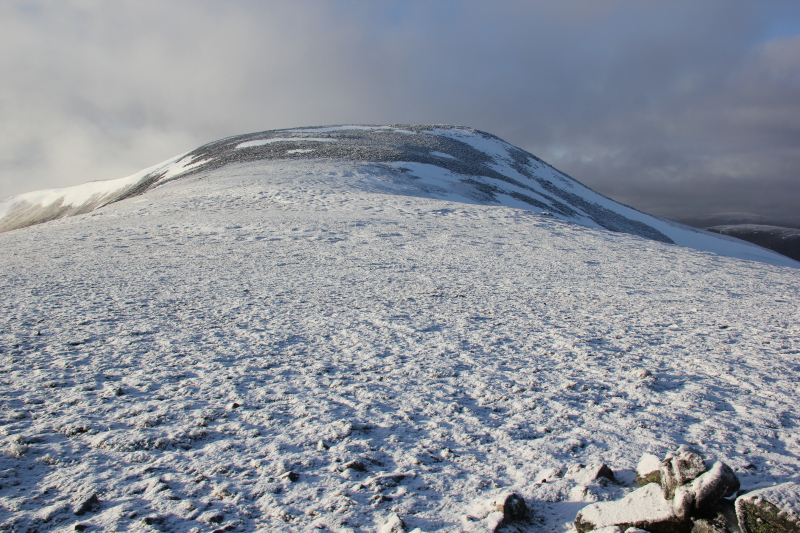 The final 50m ascent was up fairly steep compact snow/ice. A mix of kicking and cutting steps up this section got me to the summit. 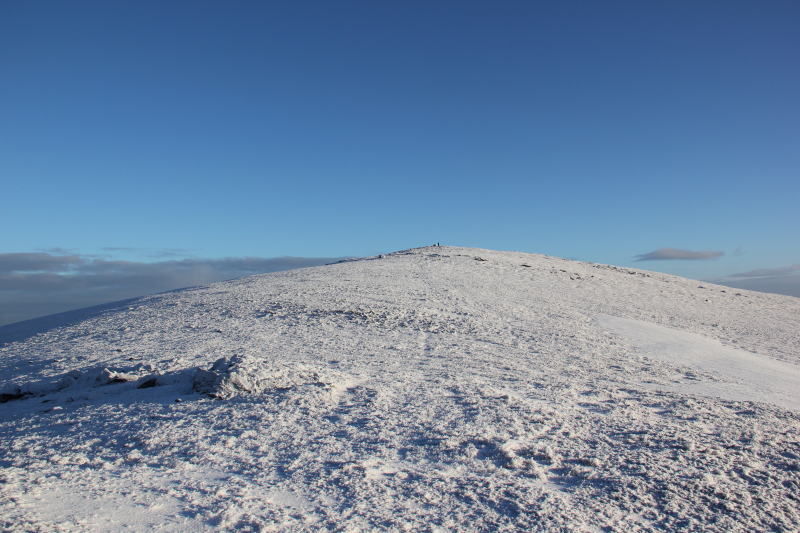 I visited the trig point and both of the large cairns. 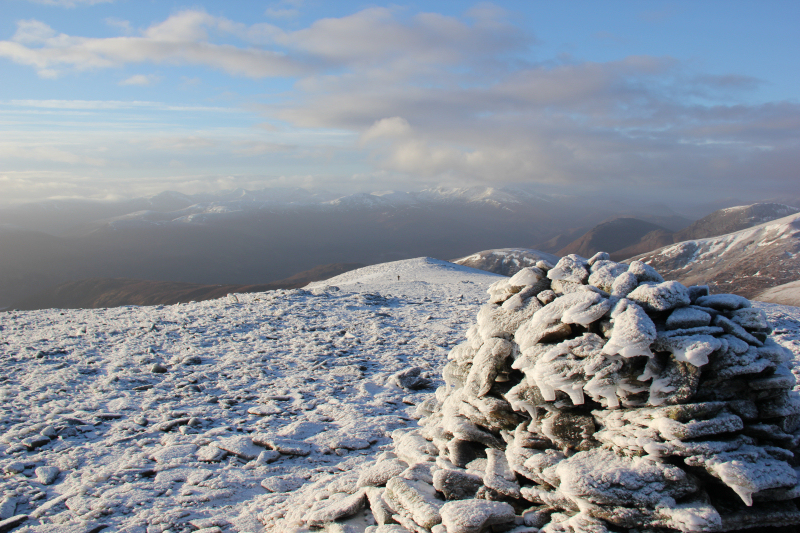 From the summit, I made my way towards Sgurr Fhuar-thuill via Creag Ghorm a’Bhealaich (Munro Top). 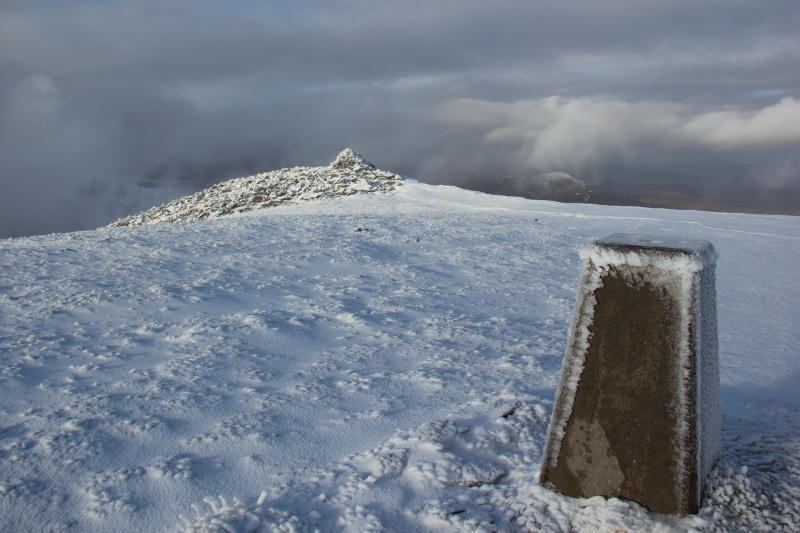 After a quick visit to Creag Ghorm a’Bhealaich, I continued on to the fourth Munro summit of the day, Sgurr Fhuar-thuill. 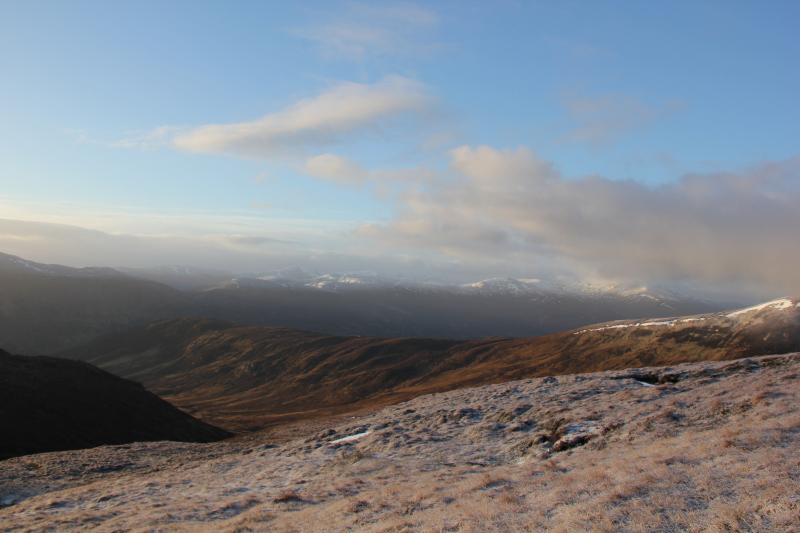 From Sgurr Fhuar-thuill, I continued on to ascend one final hill, Sgurr na Fearstaig (Munro Top). 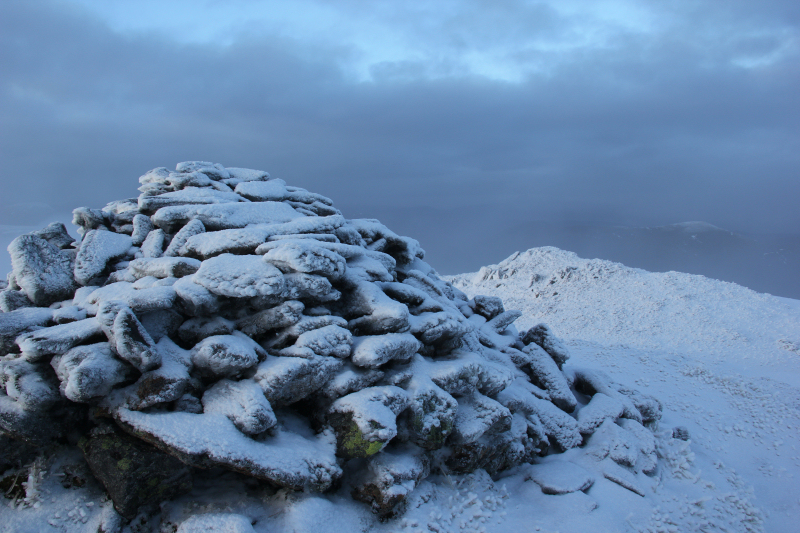 This was my first and only new summit of the day. From Sgurr na Fearstaig, I returned a short distance towards Sgurr Fhuar-thuill to reach the start of the track that descends towards Loch Toll a’Mhuic. 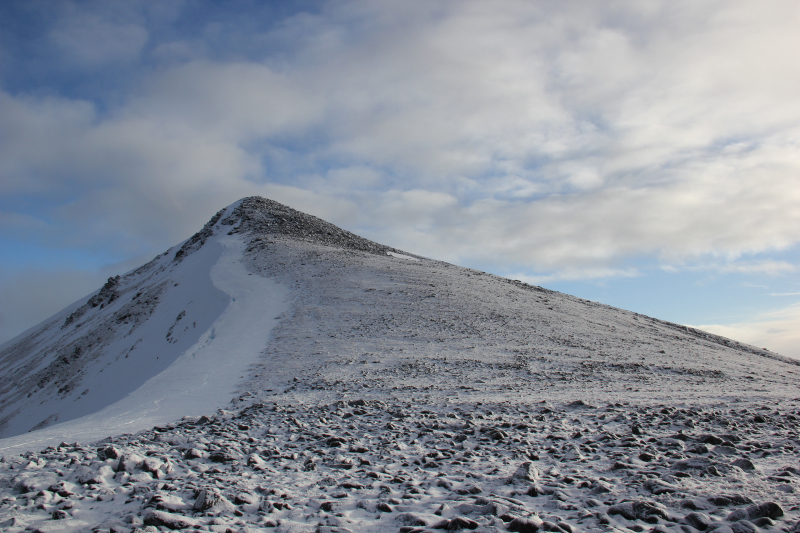 The descent track was not straight-forward, without crampons, as it was covered in sections of hard snow. 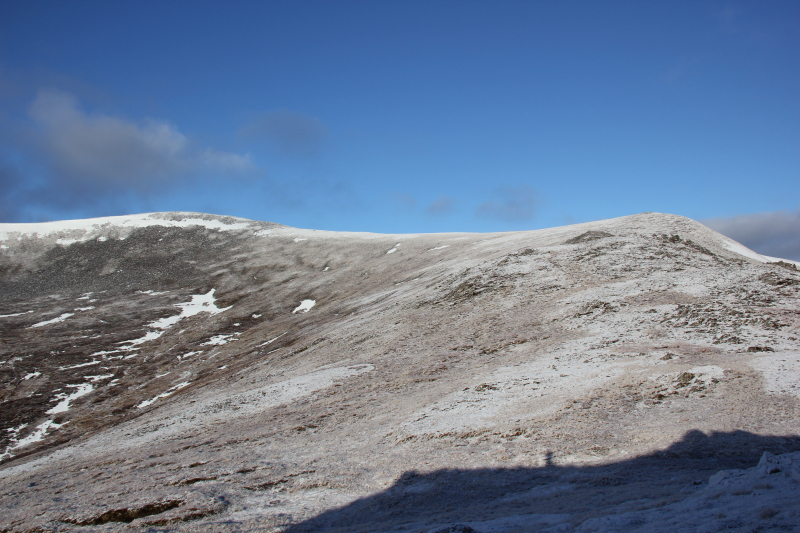 I ended up abandoning the path to head more directly towards Loch Toll a’Mhuic. 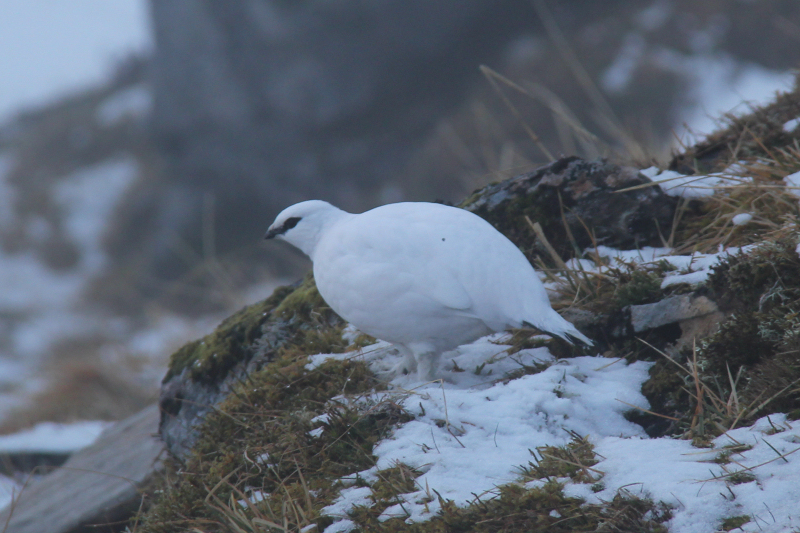 During the descent, I passed a Ptarmigan in winter plumage. 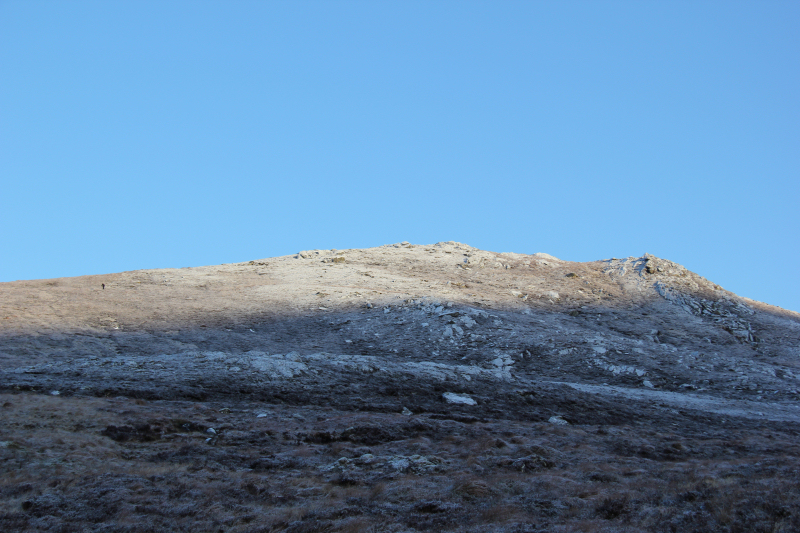 During the descent, I was particularly impressed with Sgurr na Muice. It is an incredibly rocky hill. 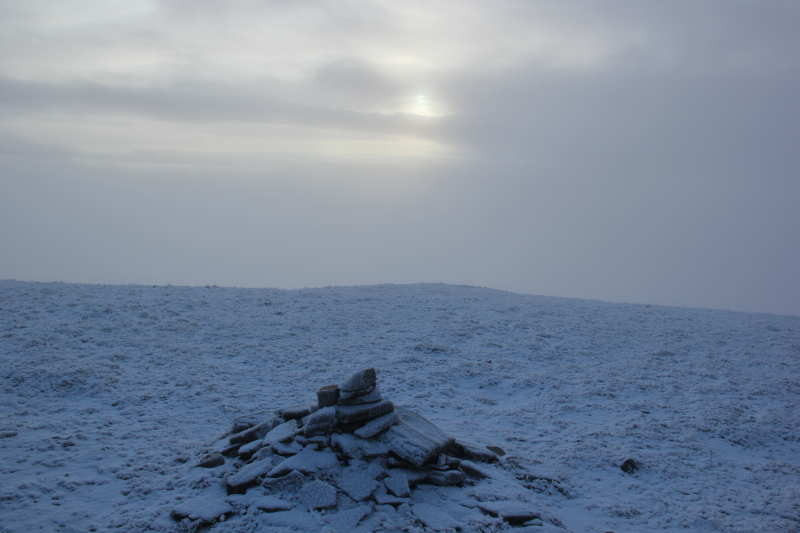 It is a Corbett Top of a Munro and a HuMP. 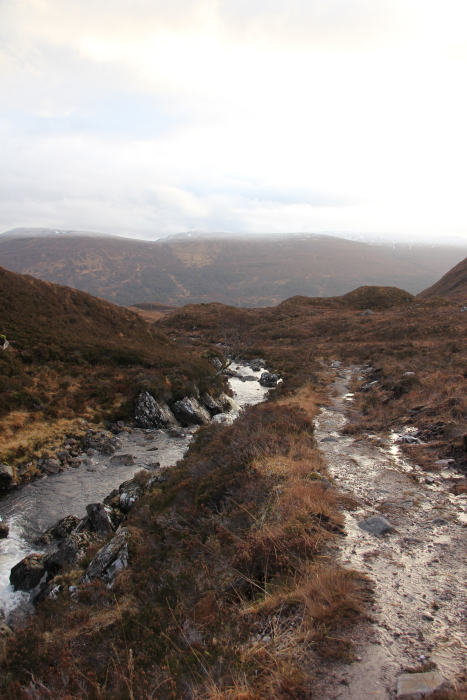 I followed the path alongside the Allt Toll a’Mhuic for much of the descent. 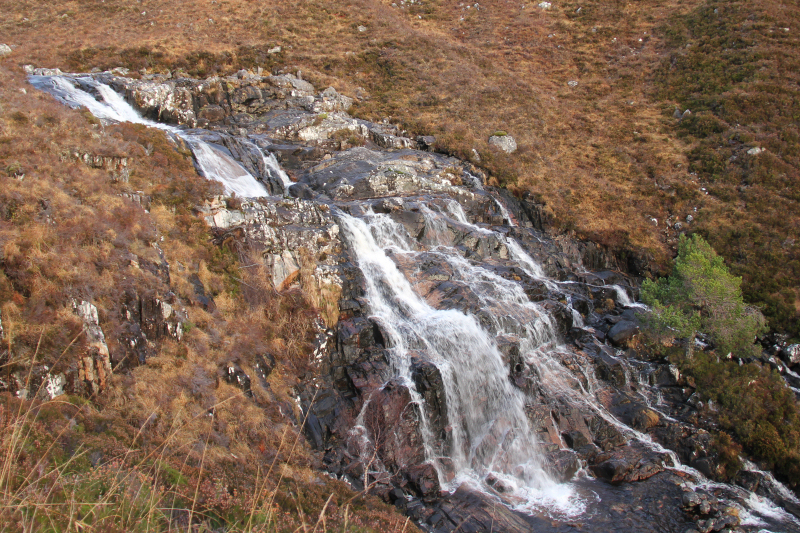 There is a nice waterfall during the descent, a short distance above the glen. 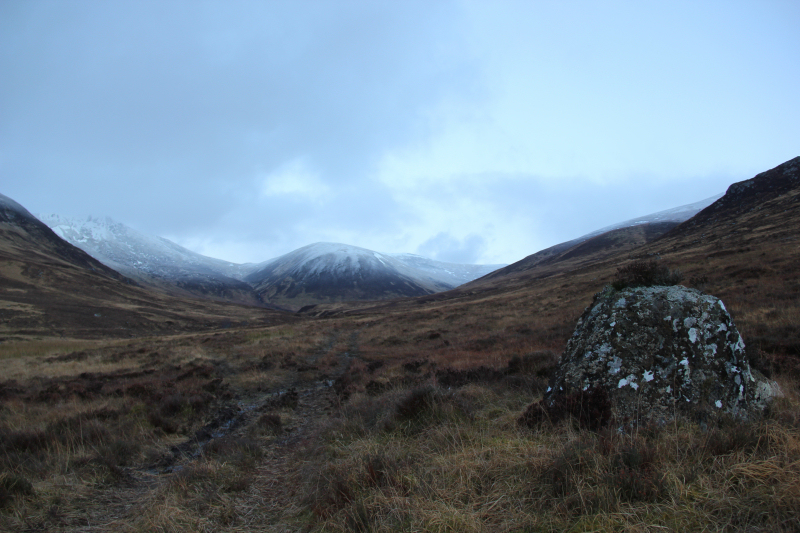 On reaching the glen, the thought of the long walk back to the car wasn’t exactly appealing. I walked along the tarmac track to a short distance beyond Braulen Lodge where I was offered a lift by one of the estate workers. Lift gratefully accepted. 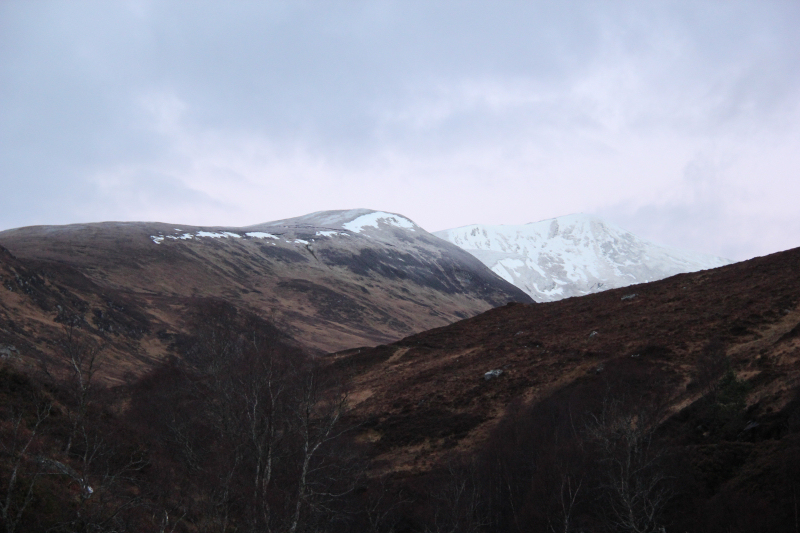 Nice to visit Glen Strathfarrar in winter. A good day out .